Hewson Lindsley Peeke was born on April 21, 1861 in South Bend, Indiana to the Reverend George Hewson and Margaret Bloodgood Peeke. He graduated from Williams College in Massachusetts. After teaching school in Illinois, he moved west to the Dakota territory where he was admitted to the bar in 1883. In about 1885, when his father was assigned as Pastor of the Congregational Church in Sandusky, he moved to Sandusky as well. After being admitted to the Ohio Bar, he practiced law in Sandusky for many years. His obituary, in the 1942 Obituary Notebook (in the Sandusky Library), stated that he was known as the “dean of the County Bar Association” in Erie County. 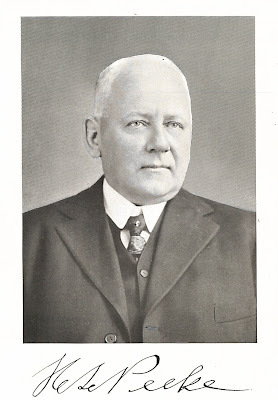 Mr. Peeke was admitted to the United States District Court in 1895; U.S. Court of Appeals in 1905; and to the Supreme Court of the United States in 1918. Local history was a favorite topic of his. He was the author of two histories of Erie County, A Standard History of Erie County, Ohio, published in 1916, and The Centennial History of Erie County, published in 1925. He also wrote Stories of Sandusky, which most people consider to be fictionalized accounts of people and incidents in Sandusky, Ohio. Mr. Peeke also served as the President of the Firelands Historical Society for a number of years. An important issue in the life of Hewson L. Peeke was the idea of Temperance. He wrote a comprehensive study of the history of drunkenness in 1917, entitled: Americana Ebrietatis: The Favorite Tipple of Our Forefathers and the Laws and Customs Relating Thereto. George Sargent, an editor from the Boston Evening Transcript newspaper praised Peeke’s book. He wrote in an article, which was reprinted in the November 20, 1917 Sandusky Register, that Peeke was “as impartial as the apostles in dealing with this subject and leaves his witnesses to be examined and cross-examined by either side. 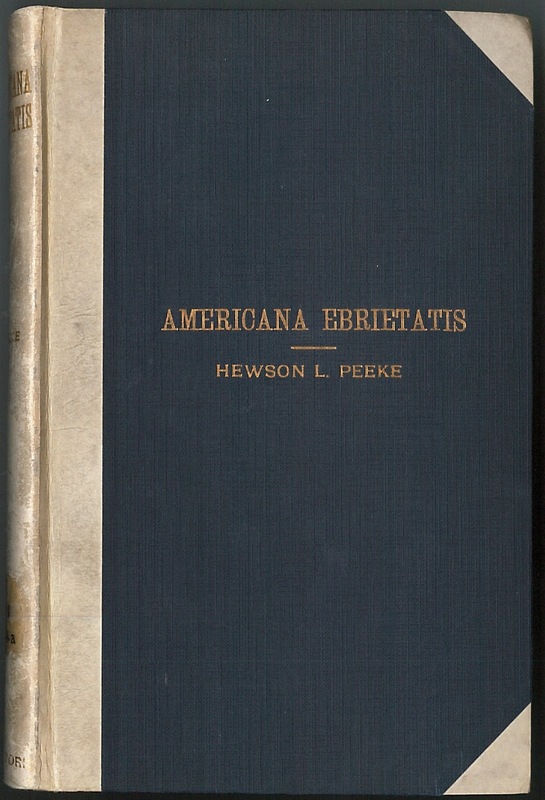 The collection of material which he has gathered gives a history of drunkenness and drinking customs in America, and while it is not the only one in the country, it is probably the finest in existence in private hands.” A copy of this unique title is in the Local Authors Collection of the Archives Research Center of the Sandusky Library. Hewson L. Peeke died on February 17, 1942. His funeral was held at the First Congregational Church, and he was buried at Oakland Cemetery. The entire local bar association attended the rites, and the active pallbearers were: Judge E. H. Savord, Judge W. L. Fiesinger, and Attorneys Earl Webster, C.E. Moyer, James Flynn and Wilbert Schwer. 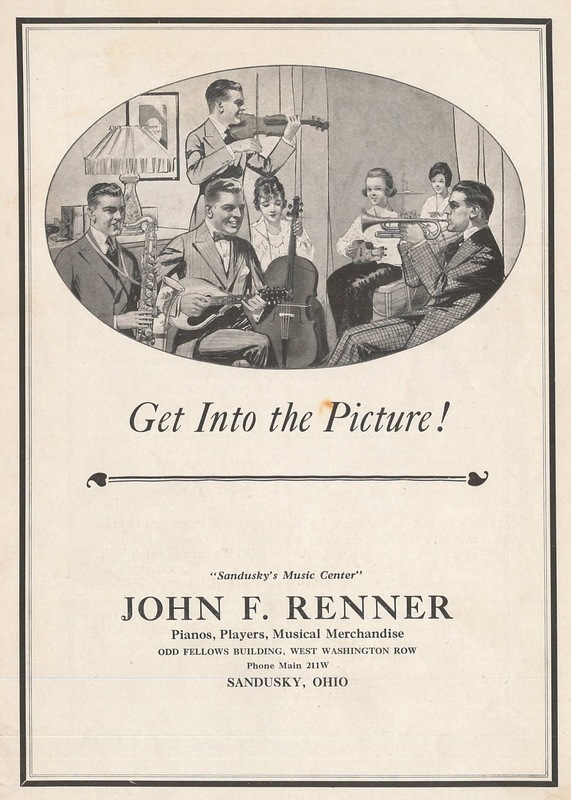 From 1890 until his retirement in 1929, John F. Renner was connected with the music business in Sandusky, Ohio. 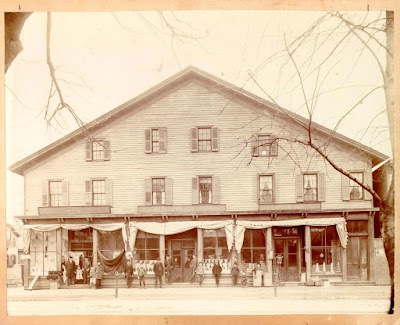 Above is an image of his store in the Odd Fellows Temple when he was in business with George Doerzbach in the early 1900s. Mr. Renner gave his customers brochures which extolled the virtues of music. 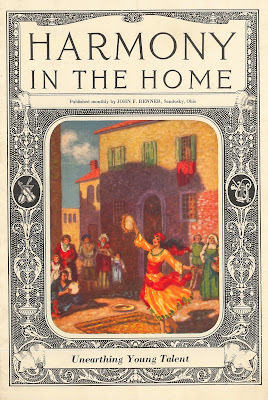 The cover of one of these publications suggested that you could “get into the picture” by playing a musical instrument. 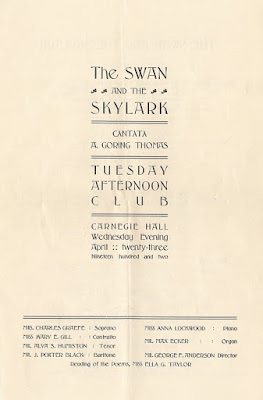 The focus of this brochure was unearthing hidden talent in children by teaching them to play a musical instrument. 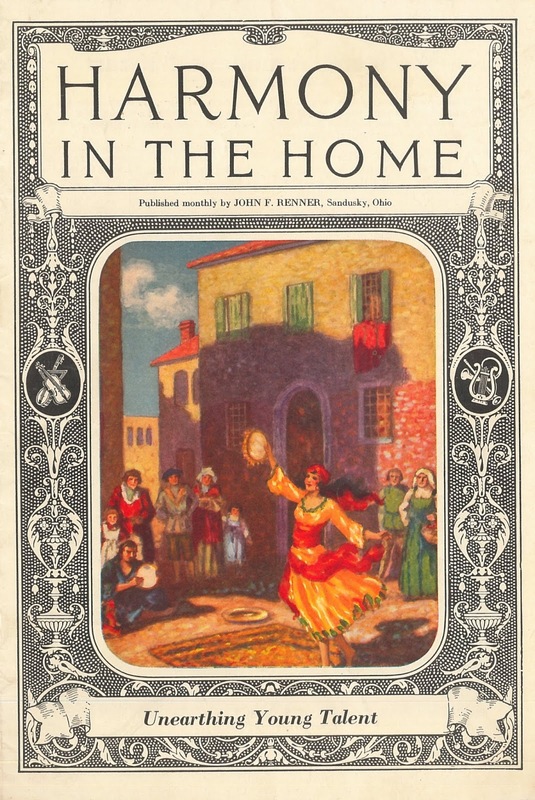 The cover title implies that music could promote harmony in the family home. Bella Webb’s article on page 9 was entitled Music Instead of Pills. She wrote that improvements in both physical and mental health could be achieved by listening to music. 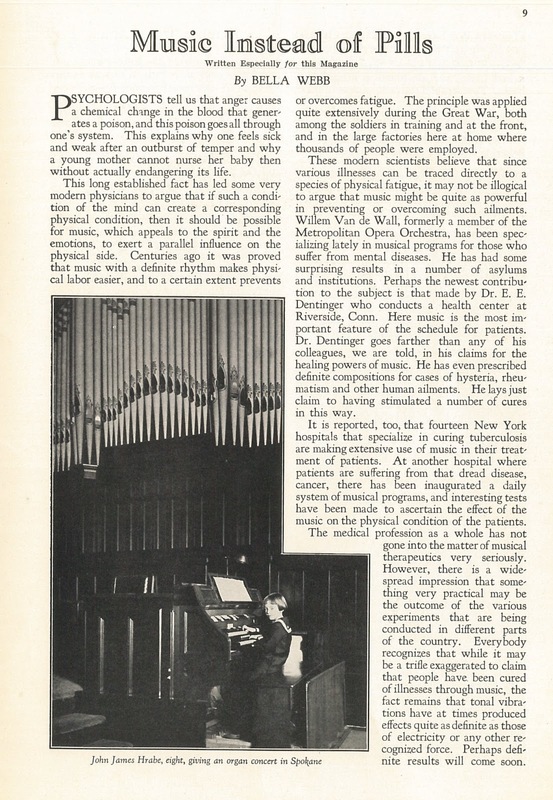 According to the American Music Therapy Association, music therapy is a health profession “in which music is used within a therapeutic relationship to address physical, emotional, cognitive and social needs of individuals.” It seems that Mr. Renner promoted these concepts to Sandusky area residents long before music therapy became a college major. According to an article in the April 15, 1916 issue of the Sandusky Star Journal, Paul Swessinger was one of Sandusky’s best known German-American citizens. He was born in Nemigen, Germany on January 15, 1849. 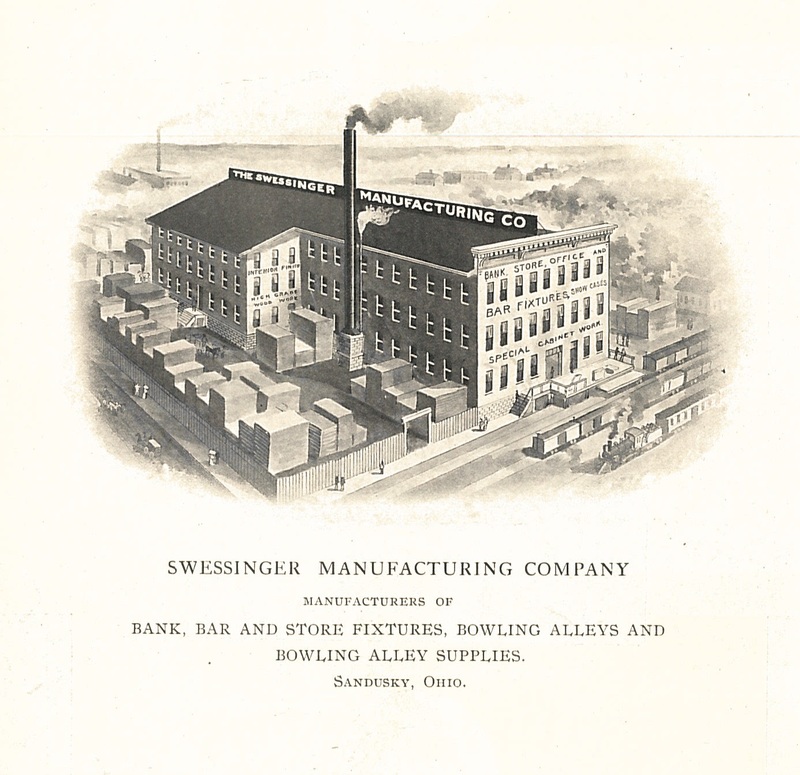 After first residing in Kelleys Island, Mr. Swessinger settled in Sandusky, Ohio. 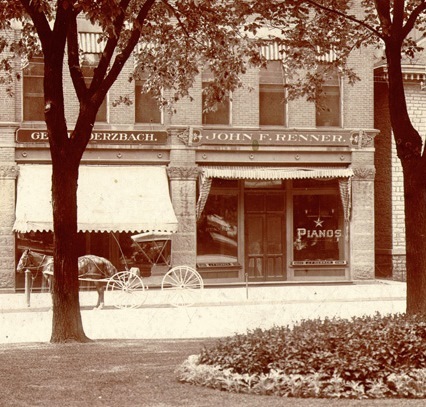 In the 1880s and 1890s, he was a dealer in groceries and provisions at the southwest corner of Lawrence and Adams Streets. 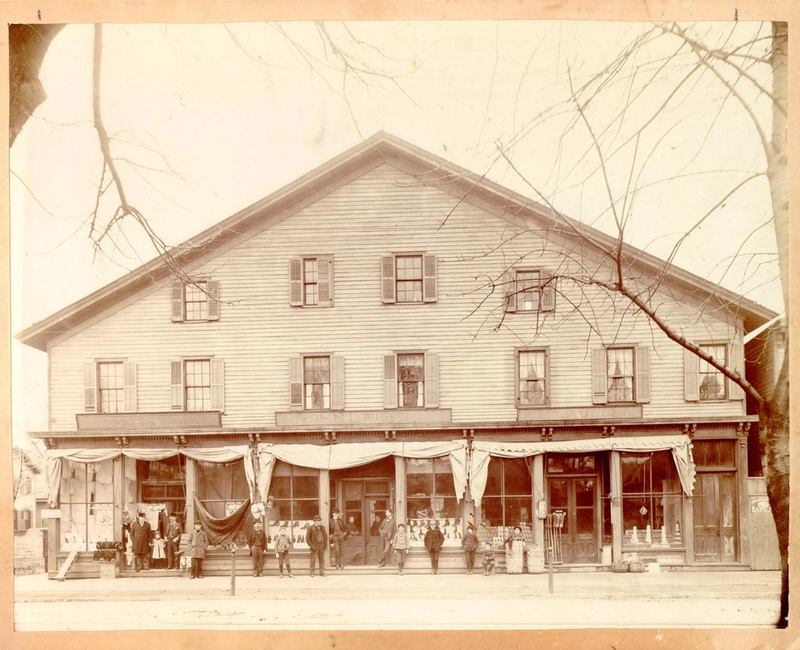 For a time he also operated a saloon and beer bottling works along with the grocery store. 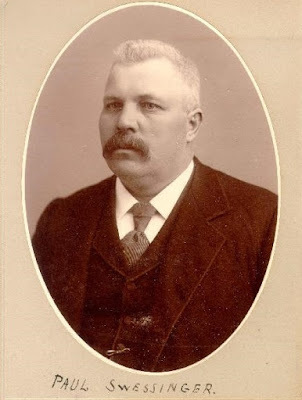 The 1900 and 1902 Sandusky City Directory listed him as the proprietor of the Imperial Cafe, a popular bar and restaurant at the northwest corner of Columbus Avenue and Water Street in downtown Sandusky. By 1904 he was also the president of the Swessinger Manufacturing Company. The company, on South Depot Street near Hayes Avenue, made and sold bank, office, bar and store fixtures. In 1910, Mr. Swessinger was operating an automobile garage on Jackson Street. 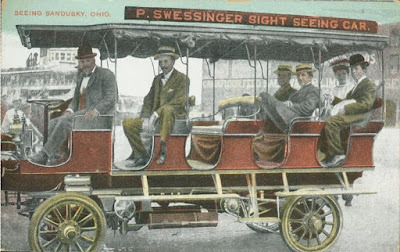 Besides the many business ventures already listed, around the turn of the twentieth century, Paul Swessinger operated a Sight Seeing Car at the foot of Columbus Avenue. The vehicle had open sides, solid rubber wheels, and was about the same size as a streetcar. It met the incoming boats and trains, to provide tourists with a tour of the city of Sandusky. Paul Swessinger died on April 15, 1916. He was survived by his wife, a son, daughter, three brothers and two sisters, one still living in Germany. Funeral services were held at his home on Central Avenue, and burial was in Oakland Cemetery. 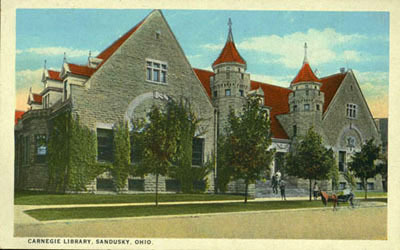 Mary A. Cooke, the wife of Sandusky businessman Charles E. Cooke, was an early member of the Board of Trustees of the Sandusky Library Association. She was on the Board in 1870 when the Library Association of Sandusky was founded, and when it was incorporated on November 5, 1895. Mrs. Cooke was born Mary Augusta Turney. She married Charles E. Cooke on May 31, 1860. Besides serving on the Library Board, Mrs. Cooke was also very active in the Martha Pitkin Chapter of the Daughters of the American Revolution. She traced her roots back to Noah Hoyt, an ancestor who served as a private with the Connecticut militia during the time of the American Revolution. On December 16, 1900, the local D.A.R. celebrated the anniversary of the Boston Tea Party at Mrs. Cooke's home, at the southeast corner of Wayne and Jefferson Streets. 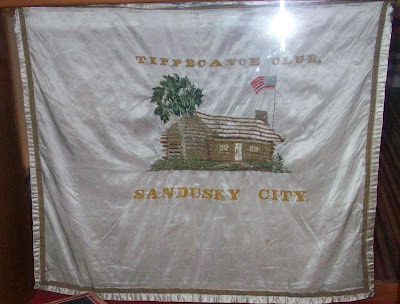 Between the parlors of the Cooke home, was displayed the log cabin silk banner which was created by Sandusky women, to welcome William Henry Harrison to Sandusky in 1840. 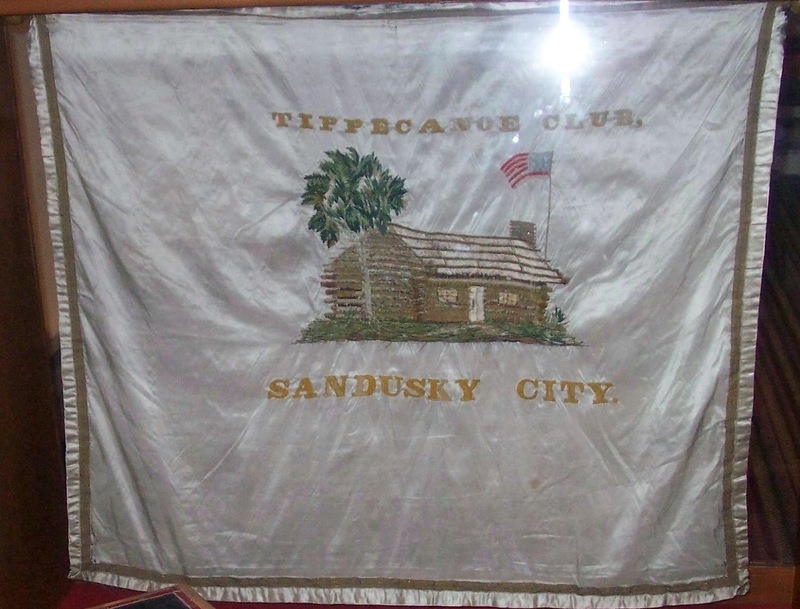 This banner is now in the historical collections of the Follett House Museum. The people at the celebration wore colonial costumes. Colonial era refreshments were served, and a quartet led by Mrs. J.W. 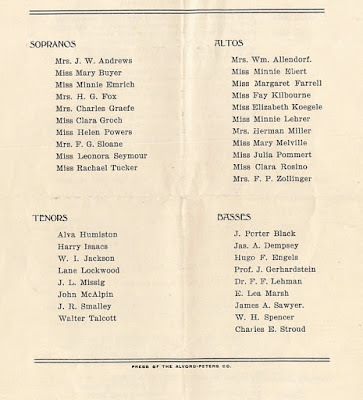 Andrews sang patriotic songs, to the accompaniment of Mrs. Frank Sloane on the piano. A summary of the celebration of the Boston Tea Party in Sandusky was featured in volume 18 of the Daughters of the American Revolution magazine. Mary Augusta Turney Cooke died at her Wayne Street home in Sandusky on May 4, 1917, after a lengthy illness. Rev. E.G. Mapes officiated at the funeral services, and burial was at Oakland Cemetery. Mrs. Cooke was survived by her daughter, two sisters and grandchildren. 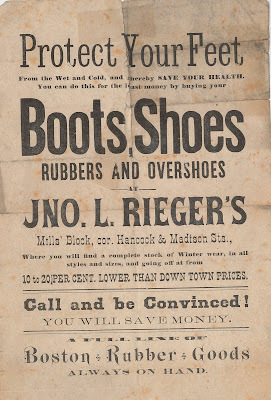 Before John L. Rieger built the Rieger Hotel, he was in the shoe business. He began working as a shoemaker in 1876, and continued until 1917. 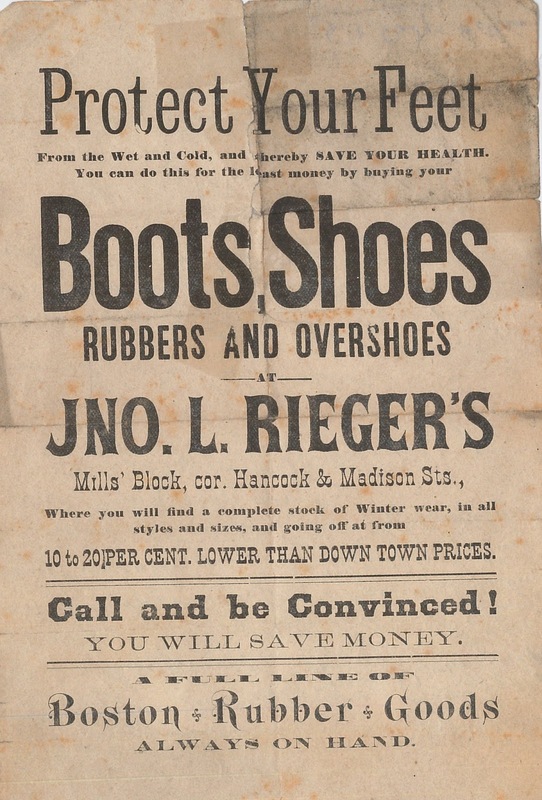 Mr. Rieger’s advertisement read in part, “Protect your feet from the wet and cold, and thereby save your health. You can do this for the least money by buying your boots, shoes, rubbers and overshoes at Jno. L. Rieger’s.” His shoe store was at the corner of Hancock and Madison Streets. Many people will remember this location as the site of the former Wholf Hardware Store. 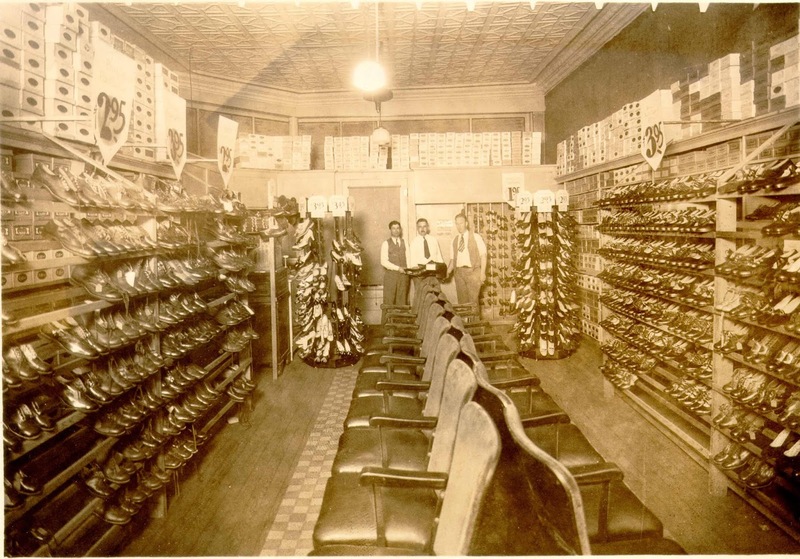 Another pioneer in the shoe and boot business in Sandusky was Leopold Federer. His ad from the late 1800s was printed in both English and German. In this particular advertisement, Mr. Federer offered boots and shoes that were “somewhat damaged” by fire and water at a reduced cost. Long before online shopping became popular, people purchased their clothing, shoes, and other necessities of life at local stores that were close to their homes. Before radio and television, locally produced musical entertainment was a popular diversion for thousands of Americans. 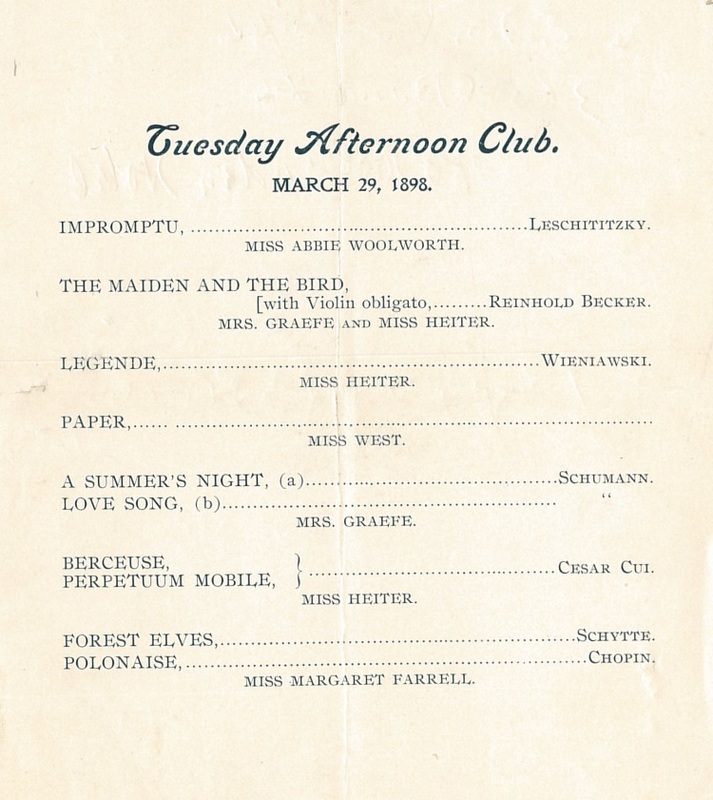 In Sandusky, Ohio a group of people formed a club known as the “Tuesday Afternoon Club.” Their first meeting was held on April 7, 1891. 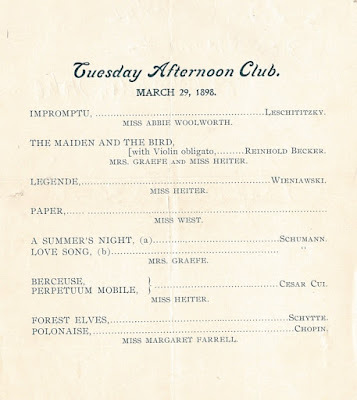 The purpose of the club was “the promotion of an interest in music, and to afford musical improvement and enjoyment to its members.” Initially the club members met in private homes, but later they gathered at various meeting rooms in Sandusky. 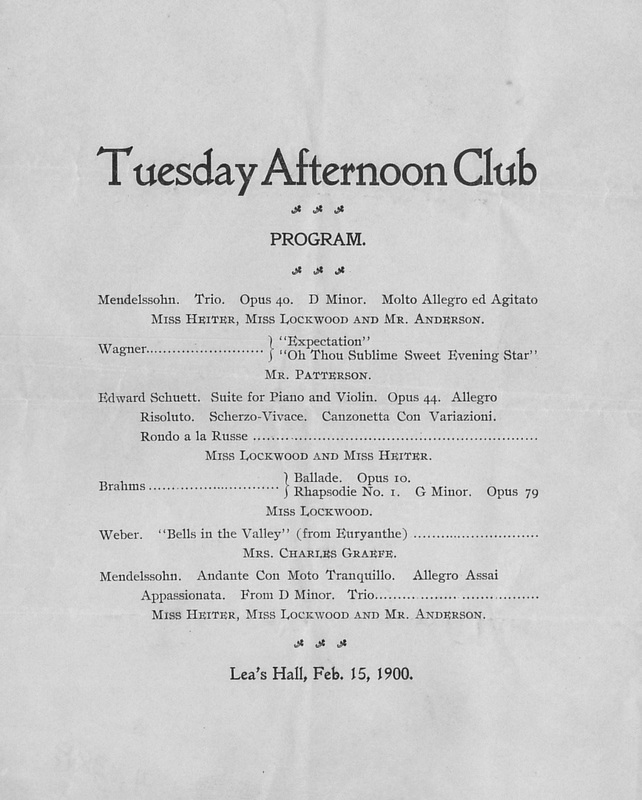 On February 15, 1900, the Tuesday Afternoon Club met at Lea’s Hall on Market Street. 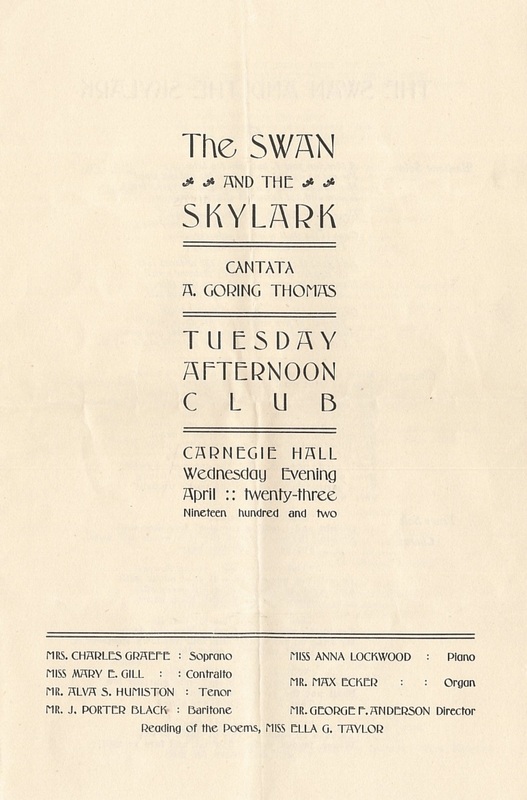 The Club performed a cantata by A. Goring Thomas, entitled The Swan and the Skylark on April 23, 1902, at Carnegie Hall of the Sandusky Library. Mr. George F. Anderson directed the production. 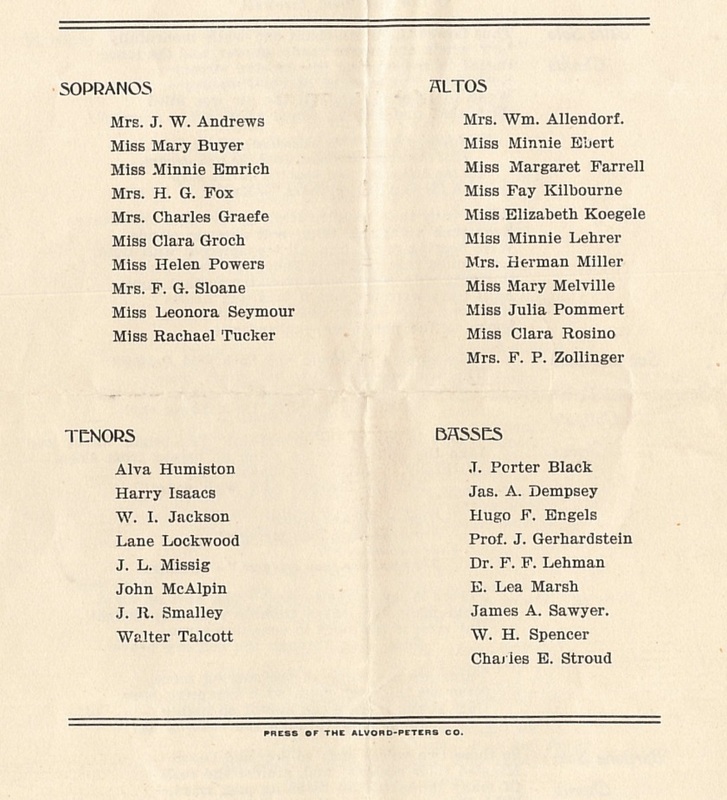 The names of the performers appear on the back of the program, listed by voice types. 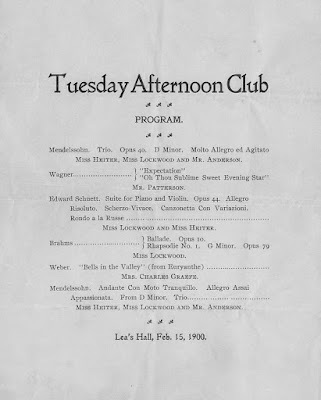 Several programs from the Tuesday Afternoon Club are found in the Sandusky Library Archives Research Center. They take us back to a simpler time, when people often relied on local talent for entertainment. Though it was only in existence for a relatively short time, the Enterprise Glass Works was once a booming business on Sandusky’s west side, on Superior Street. 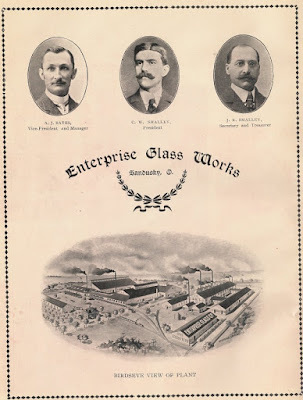 In the book What: Souvenir of Sandusky, Ohio (Hill and Dolly, 1903), an advertisement for the Enterprise Glass Works listed C.W. Smalley as President, A.J. Bates as the Vice-President and Manager, and J.E. Smalley, Secretary and Treasurer. 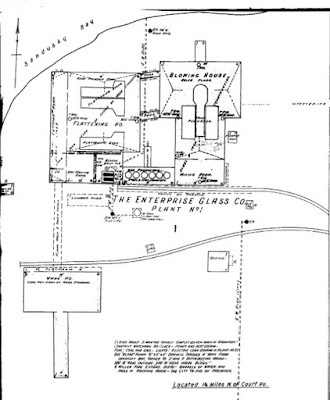 A page in the 1905 Sanborn Fire Insurance Map shows the close proximity of the Enterprise Glass Company to Sandusky Bay. Pictured is Plant number 1. Plant number 2 was adjacent to Plant number 1. 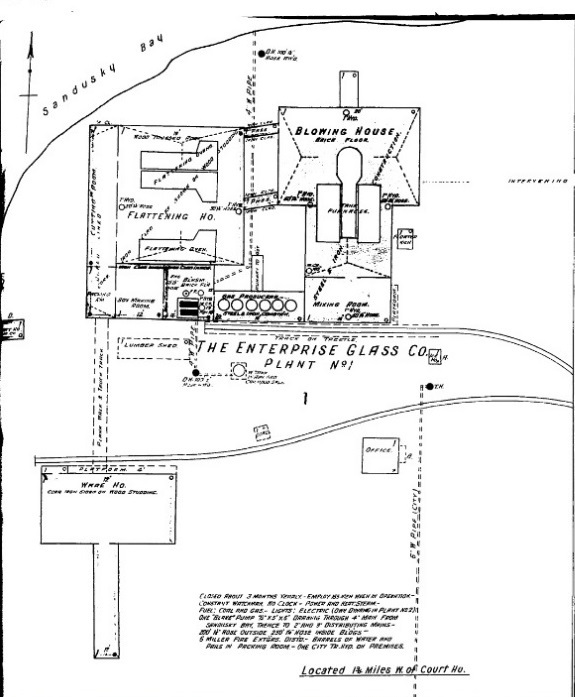 In the early years, the glass made at Enterprise Glass Works was hand-blown. Once the glass was blown, it went to another part of the plant for flattening. At the end of the day, some of the employees made glass canes and other items from glass that was left over from the day’s work. 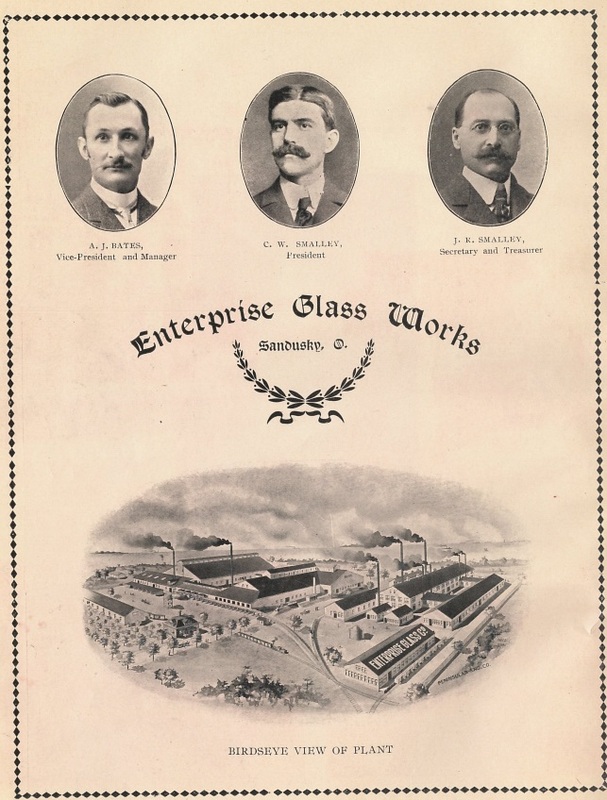 One hundred men were employed at the company in 1910, but by 1916, the Enterprise Glass Company was in receivership. In the 1920s, the Sandusky Glass Manufacturing and Supply Company was in business at this site. Periodical Publishers Service Bureau also was at this location for a number of years. To read more about glass manufacturers in the city of Sandusky, see the Sandusky Register of February 18, 1995, now available on microfilm at the Sandusky Library Archives Research Center. 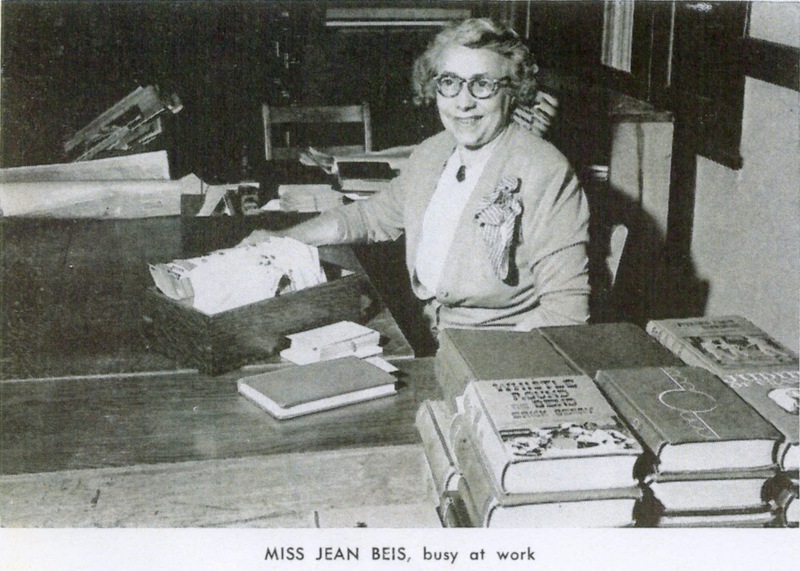 Jean Beis is pictured above in the Sandusky High School Library, on page 20 of the 1952 Fram. Miss Beis was born Jeanette Beis, in 1894, to local attorney George C. Beis and his wife, the former Lucinda Zerbe. Jean graduated from Sandusky High School in 1912, and attended the University of Michigan, graduating in 1917 with a degree in language. In 1941 she earned her bachelor degree in Library Science from the Western Reserve University in Cleveland. Miss Beis began teaching at Sandusky High School in 1920, where she taught Latin for several years. Eventually Miss Beis became the High School Librarian at Sandusky High School. In May of 1954, a slightly overdue book was returned to the High School library from the son of a former Sandusky resident. Though it was not collected, Miss Beis calculated the fine for the overdue book to be $539.70. 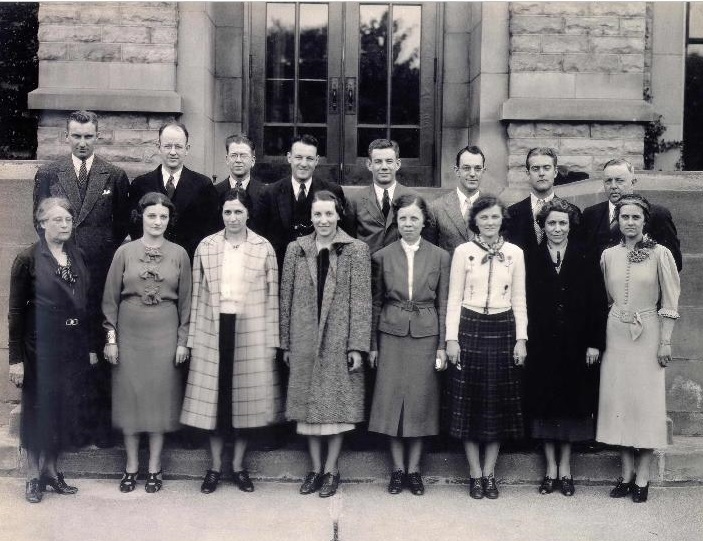 Miss Jean Beis is the second to the last person on the right, in the bottom row in the picture of the Sandusky High School faculty below. 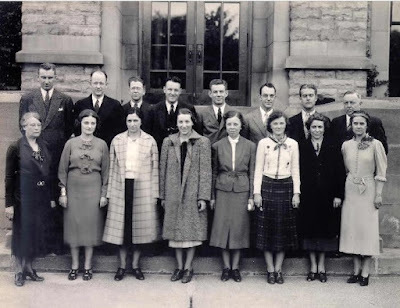 In 1951 Miss Beis attended a class reunion. She is the person on the right in the picture below, beside Letitia Adams and an unidentified male. 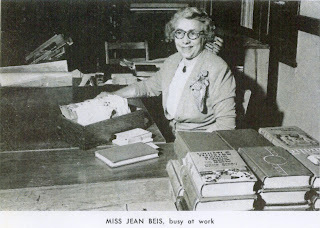 Jean Beis died on December 2, 1976 at the age of 82, at her home on Huron Avenue. She had been a member of the Sandusky Women’s College Club, Ohio State Retired Teachers’ Association, the Legion of Mary, and Sts. Peter and Paul Catholic Church. Funeral services were held at the David Suitor Funeral Home and burial was in the family lot at Oakland Cemetery. Otto J. Biemiller was born in Sandusky, Ohio on March 28, 1865 to Christian and Margaret (Weber) Biemiller. 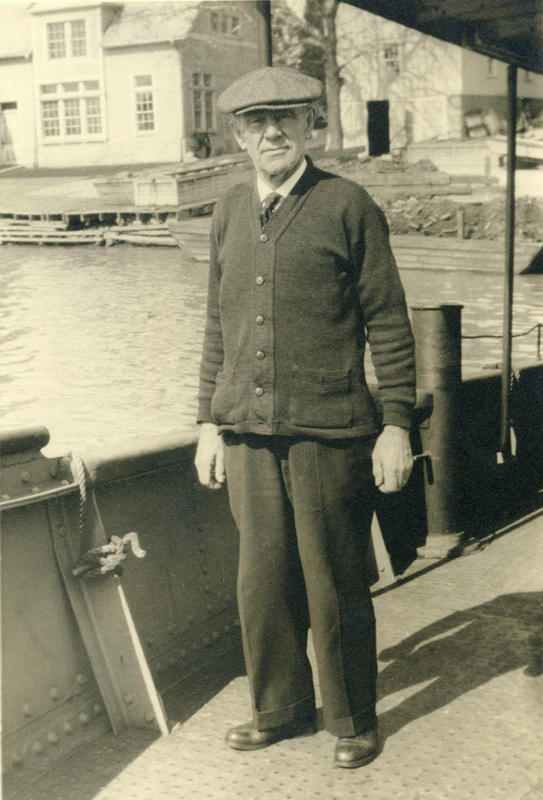 He worked on Great Lakes fishing boats for over fifty years, having served as master of boats operated by the Post Fish Company and Lay Brothers Fisheries. Earning his first-class pilot papers in 1891, some of the boats that Captain Biemiller served on as Master were: the Anna Roberson, Erie, Silver Spray, Maythan, Markwell, the Driscoll, and the Canadian steamer Thistle. On December 25, 1909, Captain Biemiller rescued the sons of Erie County Auditor, John Deist. William Deist, age 13, and Carl Deist, age 8, were ice skating on the Jackson Street slip when Carl fell through the ice, and William fell into the icy bay as he tried to rescue his brother. Though the ice was cracking, Captain Biemiller walked across the thin ice and grabbed Carl. William was then able to remain afloat while he waited for Biemiller to assist him. The April 23, 1911 issue of the Sandusky Register reported that Captain Biemiller had also rescued a party in distress on Lake Erie in Vermilion in June of 1902. In January 1938, Captain Otto Biemiller retired as Master of the Shearwater, a vessel used by the Ohio Department of Conservation, in conjunction with the fish hatchery at Put in Bay. Otto Biemiller died on January 2, 1942, after having been in failing health for some time. Funeral services were conducted by Dr. Donald Wonders at the Keller Funeral Home, and burial was at Oakland Cemetery. 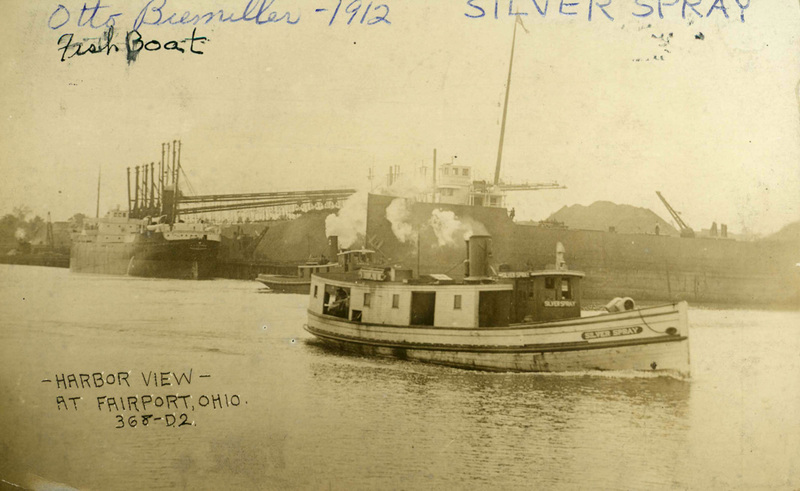 The Biemiller family was well known in Sandusky. 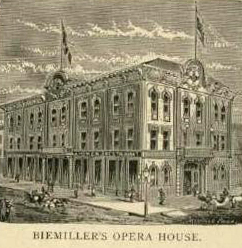 Otto’s uncle, Andrew Biemiller, was a prosperous fisherman, and was owner of the Biemiller Opera House which he had built in the 1870s. 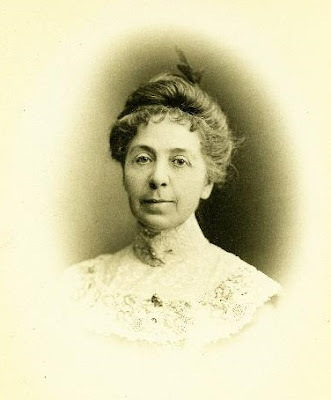 Katharine Sprague Alvord was born in Sandusky, Ohio in 1871 to Mr. and Mrs. F.W. Alvord. Katharine’s father was engaged in the wholesale fish business, and was a partner in the Alvord-Peters publishing company. 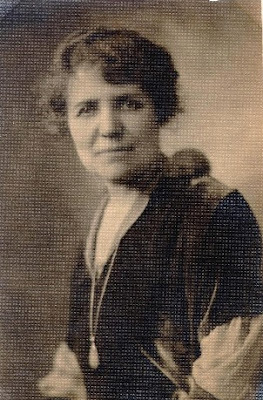 After graduating from Sandusky High School in 1889, Katharine earned a bachelor’s degree from the University of Michigan, and a Master’s degree from Columbia University. She studied for a time at Cornell University as well. She taught for several years at Oshkosh State College in Wisconsin in the late 1800s and early 1900s. 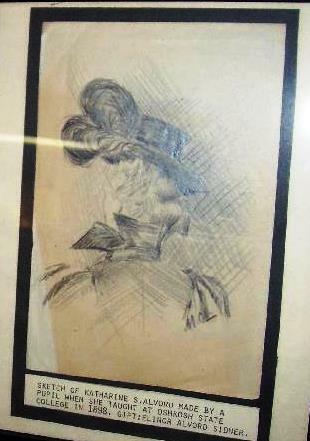 While at Oshkosh, a student made this sketch of Katharine, which is now housed at the Follett House Museum. 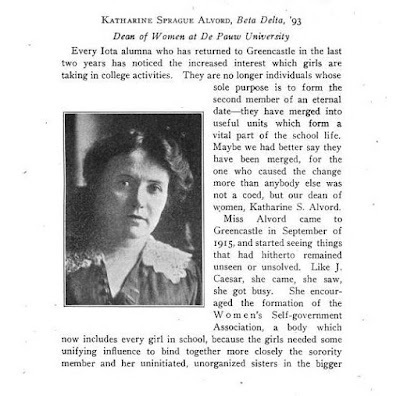 Katharine Sprague Alvord was DePauw University’s first Dean of Women, serving in that role from 1915 to 1936. A student duplex on the campus of DePauw was named in her honor. 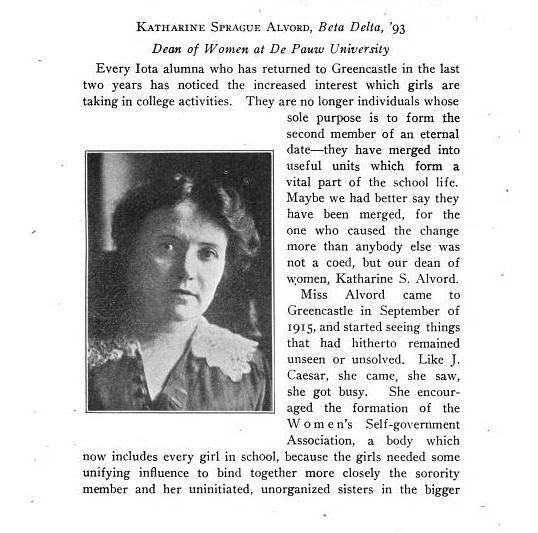 She is credited with starting most of the women’s organizations on campus at DePauw, and she encouraged dozens of female students to pursue advanced degrees. 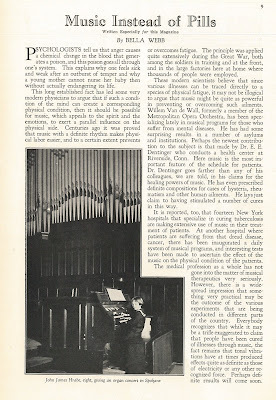 You can read a bit more about Ms. Alvord in this college publication. 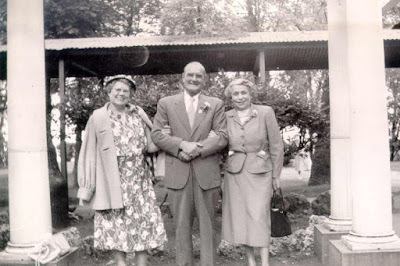 When Katherine Sprague Alvord retired, she moved to Gaylordsville, Connecticut, where she died in 1960 at the age of 88. Miss Alvord’s final resting place is in the Alvord family lot at Sandusky’s Oakland Cemetery.